Normally, my Friday night commute on L.A.'s traffic-choked 405 freeway from West Los Angeles to the San Fernando Valley is anything but pleasant. Traveling five miles can take 20 minutes or more, and it's easy to get your blood boiling when you're staring at a sea of red brake lights. 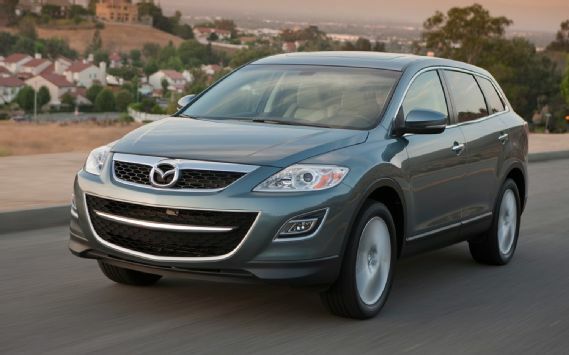 But something was different on this particular Friday while at the wheel of the 2012 Mazda CX-9. I was actually enjoying the ride -- whether I was moving or not. When you first approach the CX-9 from the front, it vaguely resembles a minivan, with its rather long 42.4-inch front overhang ending in that Mazda smiley face. But walk around it, and what you see is a sleek SUV dressed up with chrome-lined windows, substantial chrome door handles, and 20-inch wheels completing the CX-9 Grand Touring edition's upscale look. Step inside the 2012 CX-9 Grand Touring (the model was just refreshed for the 2011 model year) and it's like entering a hip, leather-swathed downtown L.A. loft. Its soft-to-the-touch leather seats feel like they're made from the same pressure-absorbing material as a Tempur-Pedic mattress. The steeply raked and ample windshield provides a clear view of the road, helped by the high seating position that will fool you each time you exit the car, because the CX-9 rides low for a big crossover, with an 8-inch ground clearance. Road noise and other outside clatter is well-isolated inside the CX-9, further enhancing the overall cabin experience. Chipping a FWD SR20DE ECU, or Just us the FWD SR20det ecu? White Axis touring cup for SALE!! or trade..